Tomorrow Center teachers and staff serving the Thanksgiving Feast from left: Josh Hunter, Social Studies teacher; Jeff Hubschman, volunteer; Jessica Anderson, Science Teacher; Holly Wilson, English Teacher; Jamie Byrne, TC Director; Katelyn Lee, Math teacher and in the background Sarah Shaffer, Study hall supervisor. 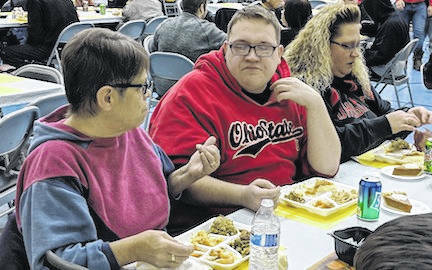 Students share Thanksgiving dinner with parents and classmates. Students, parents and community residents gathered at the Tomorrow Center in Cardington Nov. 16 to enjoy turkey and all the trimmings. The community “Thanksgiving Feast” started as a tradition when the school was in Edison and has continued ever since. TC Community Relations Director, Susie Sexton recalled when she and the teachers and parents used to make all the turkey and side dishes. She is very happy that the TC Food Services Director Shelly Mooty took over the task of cooking along with two students. “It was Thanksgiving dinner for 300,” said Mooty with a laugh. She was thankful that her student helpers came in the day before to help with all the preparation. Sexton said there are currently 116 students in the school that range from seventh grade through high school. She credits much of the success of the school to the small classroom size that allows teachers to give more individual time to students. Junior Cheyenne Patrick said there may be a little bit of bullying, but bullies are noticed. She said something is done right away to stop a bully. Eighth grader, Taylor Shay said the education system is also good at the TC. Teachers give students more time to complete assignments and they take time to answer questions. Patrick said that going to the center has made a big difference for her. 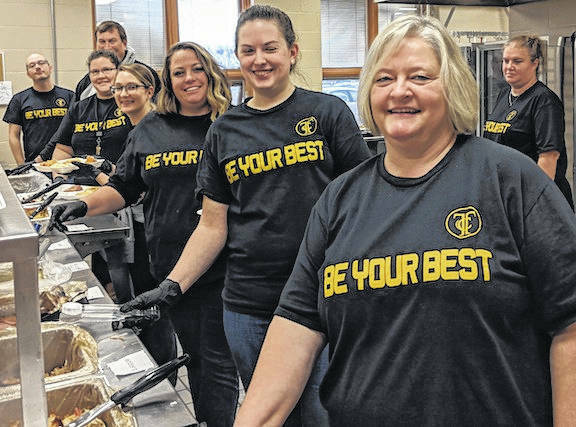 The Tomorrow Center is an Open Enrollment School, listed by the Ohio Department of Education as a Community School and sponsored by Cardington-Lincoln School District. The Tomorrow Center serves students from all the Morrow County Schools as well as the surrounding counties. The school’s website is thetomorrowcenter.org.